Playing video games isn’t the reclusive, living-in-your-parents-basement kind of activity as they used to be. Nowadays, video games are getting the kind of attention they deserve, with many celebrating their technology, art, music, and stories. Playing video games is more social than it ever has before with online capabilities. Yet, there still seems to be that generation gap when it comes to gaming, at least in Rachel’s and my life. 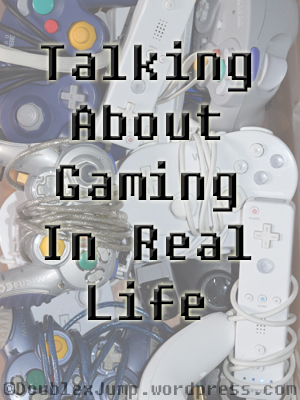 Do you publicly announce that you play video games on a regular basis? I don’t. Of course, I don’t keep it a secret, but it’s not exactly every day conversation when you’re surrounded by people who don’t understand gaming or look down upon it. I’ve had coworkers who wouldn’t mind discussing which Pokemon starter we were going to choose in the new games or, most recently, teasing me about how amazing Breath of the Wild’s open world is, but video games isn’t a common topic that I share on a daily basis. I geek out with Rachel and online friends mostly. Most of my co-workers are older than me and find video games to be a waste of time and money. They don’t knock it because they know I play, they just don’t get why I play. They don’t see the art behind it between the graphics, music, story and character developments, etc. It’s a shame, isn’t it? I bet they don’t talk down movies or even books, probably praising the cinematography, the music, the story, and all that jazz. We’re fairly lucky with our parents being supportive of our hobby, even if they don’t totally understand it. They get our enthusiasm and try to be enthusiastic with us! I know, I don’t understand it. At least with video games you’re doing something rather than just watching the screen. You’re solving puzzles, following along with a story, etc. I suppose they could argue that they’re going out and being social and other such nonsense, haha. But, hey, we’re fairly social thanks to video games too! Honestly, we see so many people out and about glued to their phones nowadays. Video games are better than that, definitely! It’s great that the video game community is so great because it’s sad that people who don’t play games just don’t see what’s so awesome about it. Do most people know you play video games? How do they react? Let us know in the comments below! I have personally been playing video games since I was old enough to pick up a controller and read on my own. Before then, I had watched my father, uncles and, occasionally, my older sister play games. While I’ve played games on the NES, the first console I have concrete memories of is the SNES. Back then, we’d simply have the game cartridge that housed the entire game — no DLC nonsense — and a controller or two in order to enjoy the video game. I believe I started playing games once I was able to pick up a controller, too. However, I enjoyed watching you play mostly. I didn’t start seriously playing games on my own until I was much older. While I remember watching you play games on the SNES, my earliest memories are from the Nintendo64. I remember playing Pokemon Stadium with you all the time. We’d pop the game in, occasionally have to take it back out to blow in it, hit power, grab the controller, and then begin to play. It was that easy, that simple. Back then, you unlocked secret characters by playing the game, devoting hours to learning the world. Now you unlock extra characters with a credit card. Back then, your save files were on the cartridges themselves. Now you pay extra for more storage space so you can download and save games. There are times when I miss the simpler past of video games. The difference between then and now is that everything is all about money and things are much more expensive than they used to be. Nintendo is a business and that comes first, despite how much they love their audience. And yet… back in our day, multiplayer games were only for two people. Now, we’re able to connect and enjoy games with people all around the world. Back then, the graphics and music were wonderful, but now we have HD images and orchestras to blow us away. Back then, we were told to sit farther back from the television or we’ll ruin our eyes. Now, we have virtual reality. It’s amazing how far technology has come, isn’t it? And it makes me wonder how it’s going to be just two years from now. While they’re promoting the Switch I’m sure they’ll begin working on something new and it makes me wonder how amazing that will be. Video games fascinate me and not just because they’re fun, but because of all the time, effort, art, and creativity that goes into it. While there are times when I miss the simple old days of gaming, it’s remarkable how far we’ve reached in terms of technology and community. I’m sure the Switch will continue to push onward and promote that sense of kinship among gamers, and I’m looking forward to it. Playing the old games fills me with joy, but that’s also what the virtual console is for. 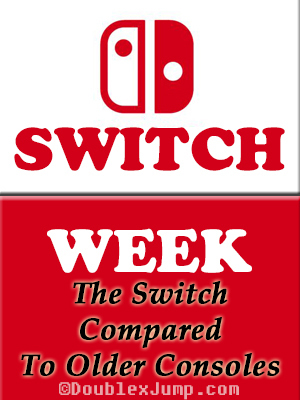 I too am looking forward to what the Switch brings us and what the future holds for gaming. Are there any features you wish the Switch has that older consoles had? Do you miss the older consoles and/or are you absolutely in love with the new technology? Let us know in the comments below!